Natalie is a dream-come-true from the Cadillac of the Stam 50 line. Her great-grandmother, Riduna, is a full sister to Anton 343. Sired by the famous European stallion, Tsjerk 328 Sport, #1 on racial type and conformation, Natalie also carries the “tall” gene from her maternal great-grandsire, Pyt 325 (Barteld). 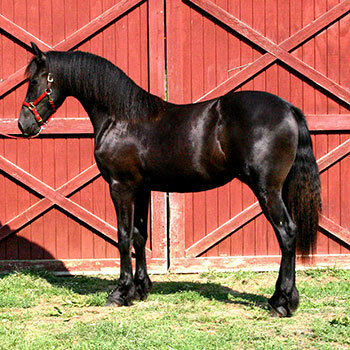 Her dam is the exotic star mare, Yldau fan Lutke Peinjum. Yldau already has 3 points towards preferent. 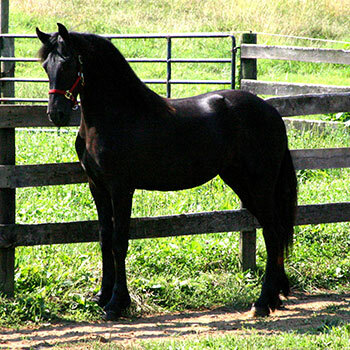 Leggy, with an exquisite head and neck, and quick as a cat, Natalie is everything one could imagine in a modern Friesian. She is a 3rd premie studbook mare. She will be bred to Lolke 371 Sport for the magical “Oege x Tsjerk” cross.